1. 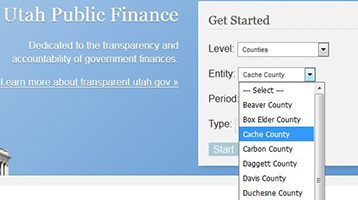 GET STARTED: On the Utah Public Finance (Transparency) website, use the "Get Started" section in the upper right-hand corner of the screen. 2. 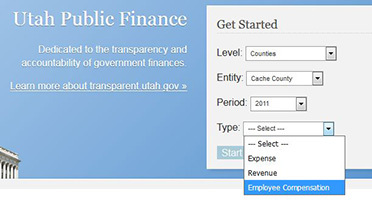 LEVEL: Choose the level of the desired government entity in the drop-down list. If you are looking for state universities, select "Higher Education" instead of "State." 3. 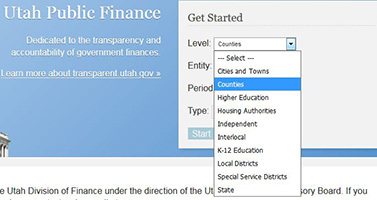 ENTITY: Choose the desired government entity from the drop-down list. 4. PERIOD: Choose the period of time, i.e. year. Please note that government entities report their employee compensation (payroll) data once a year, within three months of the end of the reporting period. Typically, this is done by September 30 for fiscal year reporting period, and by March 31 for calendar year reporting period. 5. 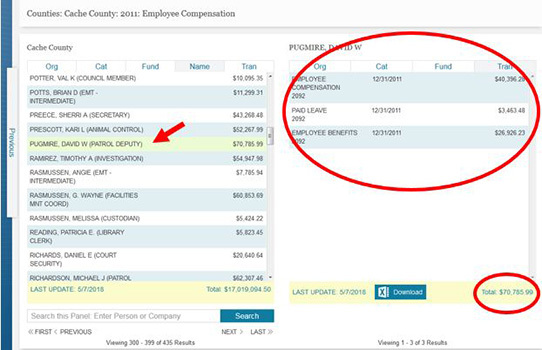 TYPE: Choose "Employee Compensation" as the type of data you want. 6. After completing all selections, click the "Start" button. 7. By default the data is displayed by organization (Org). To see the names of individual employees, select the "Name" tab. 8. 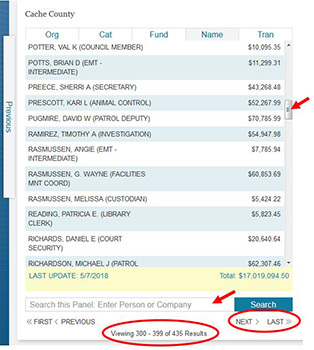 Names are displayed alphabetically by last name, along with the position title in parenthesis. The amount displayed is total compensation (wages and benefits). At the bottom of the screen is a search bar where you can enter a specific name to locate a record faster. Use the side scroll bar and the navigation arrows to view additional records. The number of records on view is displayed at the bottom. 9. 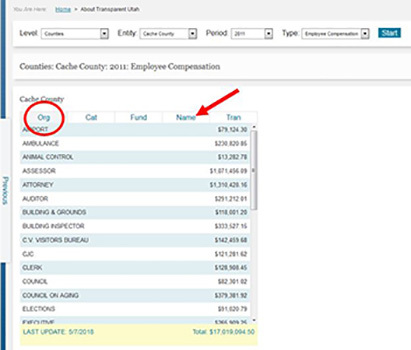 Select an employee to view detailed payroll data by type of compensation. 10. 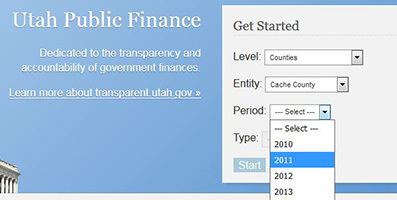 Click the image below to go to the Utah Public Finance (Transparency) website (transparent.utah.gov). You will leave the Division of Finance website.